Pictured are some of the participants for the Area Agency on Aging District 7 “10 Million Steps to Prevent Falls” walking event. 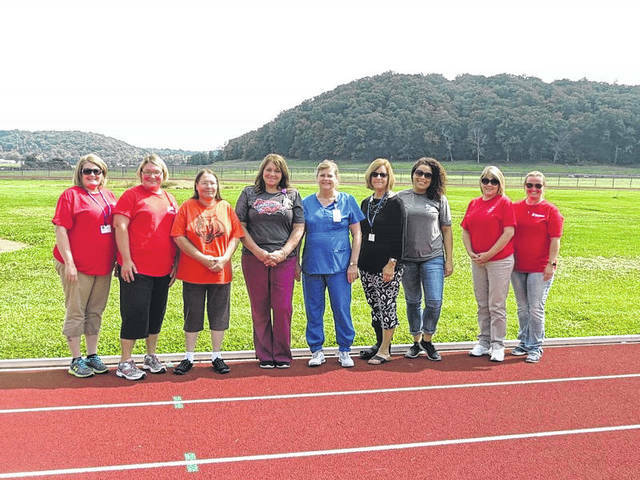 RIO GRANDE — The Area Agency on Aging District 7 recently hosted a one-mile falls prevention awareness walk at the University of Rio Grande and Rio Grande Community College track. The event was dubbed “10 Million Steps to Prevent Falls” and was sponsored by STEADY U Ohio to observe National Falls Awareness Month in September. Twenty-two individuals walked 44,000 steps in the name of falls prevention. According to Agency on Aging claims, falls among seniors in Ohio have reached epidemic proportions. One in three seniors will fall this year and falls are often considered the leading cause of emergency room visits, hospititalizations and deaths among the elderly. The agency does not consider falls a normal part of aging and that they are preventable. STEADY U Ohio is a falls prevention initiative led by Gov. John Kasich and the Ohio Department of Aging and supported by the Ohio Government and state business partners. Steadyu.ohio.gov can be visited for falls prevention resources and tips tailored to individuals, families, healthcare providers, business and community leaders. Events similar to the falls prevention walk in Rio Grande have reportedly been held across the state as part of the National Falls Awareness Month. The results have been reported to the STEADY U Ohio initiative to tally step counts towards the state’s goal of 10 million steps statewide. The agency recognized Arbors of Gallipolis, Holzer Assisted Living, Hamden Nusing and Rehab Center, Holzer Health System and the URG and RGCC track and field spring crew for their assistance with the event. For more information about falls management classes provided through the AAA7, call toll-free at 1-800-582-7277 and ask for Carla Cox at extension 22284 or Jennifer Atkinson at extension 22247. The local Area Agency on Aging District 7, Inc. provides services on a non-discriminatory basis in ten counties in Southern Ohio including Adams, Brown, Gallia, Highland, Jackson, Lawrence, Pike, Ross, Scioto and Vinton. These services are available to help older adults and those with disabilities live safely and independently in their own homes through services paid for by Medicare, Medicaid, other federal and state resources, as well as private pay. The AAA7’s Resource Center is also available to anyone in the community looking for information or assistance with long-term care options. The center is available Monday through Friday from 8 a.m. until 4:30 p.m.